A rewarding aspect of my job is receiving a new prototype kit and seeing how a design comes together as a real-life assembly. Just opening the prototype box creates an air of excitement and anticipation like that of opening a package on Christmas morning. Except, these days I have a general idea of what is actually inside the box. The latest box I received contains the prototype case assembly for the new Sterling Wall Clock Kit, which will be introduced to the Klockit line of kits within the next couple of months. 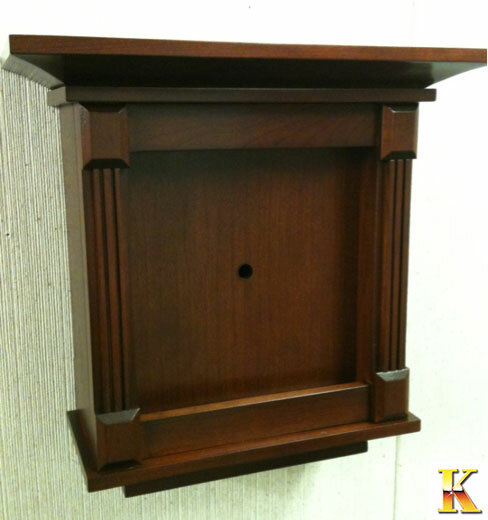 This stately wall clock will measure 11-7/8” H x 12” W x 5-5/8” D. The cherry wood assembly is suitably adorned with flat, fluted columns and beveled, rectangular end caps. The final touch of elegance encompasses an over-sized cove machined on the front and side edges of the top and bottom plates, which adds symmetry to the finished assembly. Final component determinations are still being ironed out at this time. Rumor has it, however, that the Sterling will house Klockit’s Quartex clock movement (backed by a 10-year warranty) and a silver-colored, metal clock face, which contributes to the clock’s namesake.